OPPO, the Selfie Expert and Leader, today unveiled the OPPO F5 Youth especially targeted towards the next generation, the youth. The F5 Youth is the first smartphone that sports the FHD+ full screen display model in its price segment here in Pakistan and features the ground-breaking A.I. Beauty technology – a technology designed to personalize beautification for subjects on a selfie image, has been designed to meet the demands of the youth of Pakistan. Priced at 27,899 PKR, the F5 Youth went on sale from December 8 and will be available across country. On this launch Mr. George Long CEO, OPPO Pakistan said, We believe that success is all about growing. With meticulous team work and industrious intelligence involved, OPPO strives for excellence and always satisfies technological necessities for its users. Socializing and looking beautiful is a key to happiness among youth these days so we provided the opportunity to experience the real beauty in you with OPPO F5 youth edition like never before. 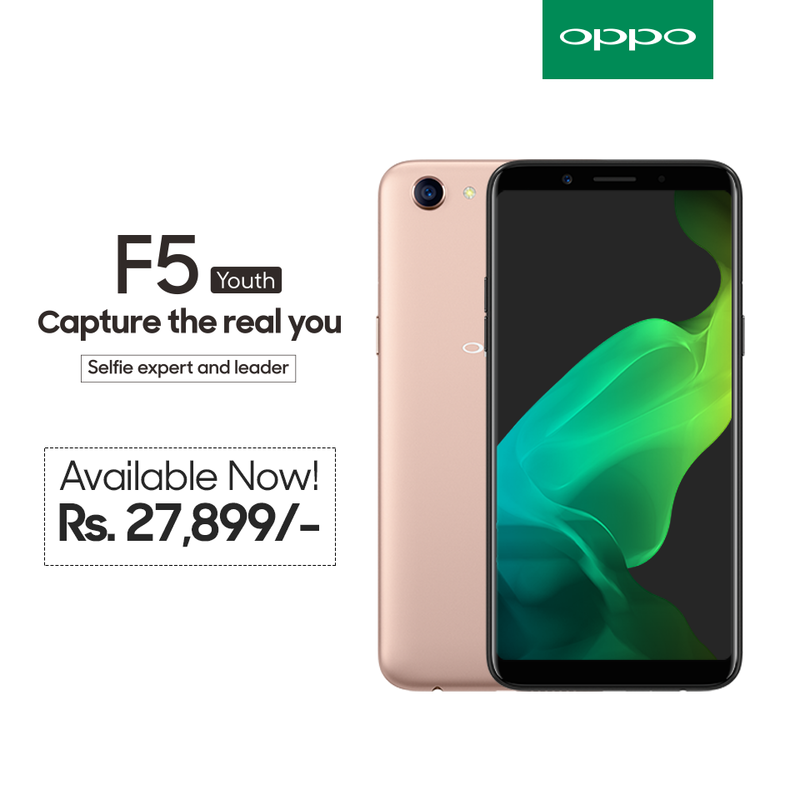 Priced more affordably, the OPPO F5 Youth features a high quality 16MP Selfie camera (f/2.0), a 13MB rear camera and an extraordinary 6 inch full-screen of 2160x1080 resolution(FHD+), bringing worthy visual and mobile Selfie experience. As the well-known Selfie Expert and leader, OPPO is stepping forward and has upgraded the built-in Beautification technology with the smart artificial intelligence and optimizations. The F5 Youth follows OPPO’s streamlined design philosophy - the sleek unibody offers a visually slim appearance without any cut-offs, with a gracefully curved body that fits well in the palm, expressing a simple and elegant look. A user’s palm will not feel tired even after using the phone for a long time, either from playing games or chatting.